Much better if these film-while-speeding motorcycle idiots are taken out by sheep before they can kill someone's family. I wonder why he didn't counter-steer? Also, he was damn lucky that sheep turned around at the very last moment as he went for the wrong side, ffs. I agree with #3 and #4. Fortunately those morons usually only kill themselves. he got really lucky it was a sheep. a deer would have froze instead of moving away. guess there's a reason for all those SLOW signs..
Didnt see no "Sheep X-ing signs"
Could be Scotland. But everyone knows there are free romaing sheep in parts of the country. And i agree, maybe the "Slow" signs DO have a purpose? That road is the Wales-England border. The sheep was just trying to make a run for freedom. It was the sheep that dodged the biker, not the other way around. 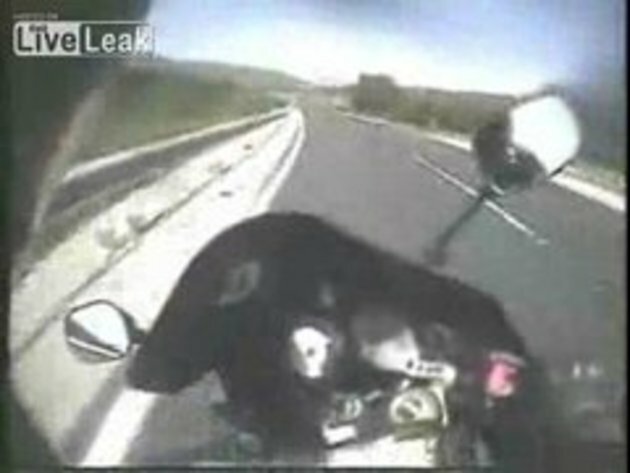 That idiot biker would have crashed on the sheep if the sheep hadn't evaded the moron motorbike driver. #5 Counter-steer? At that speed? As you can see on the video the driver did not have time to do much anything, although he did hit the brakes but it was way too late. #3 who said he was speeding. Have you ever seen a motorcycle accident. Your a piece for wishing that on someone. #16 hmmm. it seemed obvious to me that he was speeding, either that or EVERYONE ELSE on the road was going really really slow Duh!! #3 It's not like he was holding the camera with one hand and driving with the other. It's obviously a helmet-mounted camera, so what's the problem?